Explore More! – After School is an eight week program for students in grades 1 through 5. 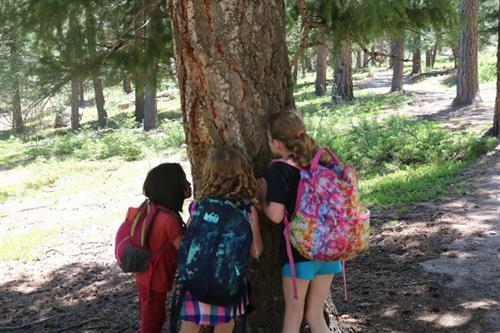 Each class will consist of a short nature-based lesson followed by activities such as games, art projects, nature journaling and hikes, of course! STEAM (Science, Technology, Engineering, the Arts and Math) concepts and project-based learning activities using science tools such as microscopes, binoculars, hand lenses and measures are incorporated into every lesson. This program is perfect for children who love being active outdoors while learning new things. Studies have shown that children who spend more time outside in nature benefit by being more physically and emotionally healthy, so sign up your young nature explorer today! Wilmot Elementary School students can meet staff members outside the school and be accompanied on a short walk to the Education Center (1/4 mile on a trail). Students from other schools can be dropped off at the Education Center at 4:00 pm.